The Emerald Ash Borer (EAB), confirmed in Milwaukee in 2012, is an invasive wood boring beetle that can kill ash trees within 2-4 years. It is estimated that nearly 50 million ash trees have been killed by EAB in the Midwest since 2002. EAB infestation is extremely difficult to detect and often goes unnoticed until more advanced symptoms such as dead branches, leafy trunk sprouts growing near the base of the tree, or bark flecking caused by woodpecker feeding is noticed. Trees found in this condition are often too infested to save. To help Milwaukee residents with ash trees on their private property prepare for EAB, the Department of Public Works (DPW) Forestry Division identified and mapped over 15,000 parcels in the city with ash trees at risk for EAB. 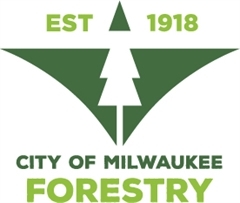 Milwaukee residents with ash trees on their property are encouraged to consider treatment or removal/replacement options prior to their tree becoming infested. Does an ash tree live on your property? Search by address on the map below. The map also indicates whether EAB is in your neighborhood. Click on the double arrows icon for the map legend/key. Trees lightly infected with Emerald Ash Borer (EAB) may be saved if treated while still healthy. Timely diagnosis is important and can mean the difference in having the option to treat an infected tree or being forced to remove the tree once it becomes hazardous. Use this guide Signs and Symptoms of the Emerald Ash Borer to help identify the Emerald Ash Borer (EAB) and possibly infested trees. If in doubt, contact a certified arborist. Trees infested with Emerald Ash Borer (EAB) may be saved if treated while still healthy. There are many insecticide options available. Use this Insecticide Option Fact Sheet or contact a certified arborist to help determine which treatment options are available. Residents can also call 286-CITY (2489) with questions. Untreated infested ash trees deteriorate quickly and can become hazardous as branches and the main trunk die. These trees must be removed in timely fashion to protect public safety and property per city ordinance 116-67. Removal of a hazardous tree can be costly. The City offers a special financing option for residents that are ordered by the City to have a hazardous tree removed. If a resident thinks they may have a hazardous tree on their property or in the neighborhood, please contact 286-CITY (2489). Greening Milwaukee is a non-profit organization dedicated to, well, doing just that! Making Milwaukee greener by showing people how easy it is to plant trees and how planting trees can have many positive effects- both on people and the environment. And they'll be happy to give you a tree - for free! Arbor Day Foundation is a non-profit conservation and education organization with a million members, donors and partners worldwide. They offer affordable trees and seedlings as well as planting and care guides and free landscape guides.